← It’s not my world, but it sure looks like it is! My colleague and friend Sarah wrote a column last week that struck many nerves. in which she referenced the Bitchin’ Sisters’ piece that went viral a few weeks ago. The Bitchin Sisters’ post was funny and sharp. It made me laugh even though I am long past the stage where I am doing or not doing crafty things to put in my children’s lunch boxes. I remember, however, a day when I tried to make Plaster of Paris handprints with my children who were at the time aged 3 and 1. I don’t need to go into the very messy details, but suffice it to say it didn’t exactly work. But the not-so-subtle message of the Bitchin Sisters’ piece is that it is easy to feel intimidated or shamed if we are not creating perfect birthday parties, or covering Rollos with yellow paper to make them look like pencils. How we as mothers react to slick Printerest posts is up to us, but the subtler message of this posts is that our children are the center of our attention. I would like to suggest that this is not a good message. 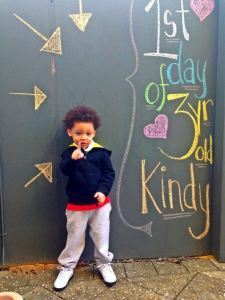 In the Bitchin Sisters’ piece, they show a picture of a child standing by a blackboard with the words “First day of 3- year- old Kindy” on his left and large arrows pointing to the child on the right. While I understand that it is a milestone of sorts if a child goes to preschool (which is another name for 3-year-old Kindy), but it is also just one of the many things that will happen to that child. If something as basic as going to preschool is treated as something so extraordinary, I wonder what high school graduation will look like, or college graduation? Will a child whose mother creates this extravagant response to preschool grow to feel that everything he does is extraordinary? We all want to raise our children to be confident, self-supporting and happy adults. We have listened to “experts” tell us that children will not learn if they don’t feel good about themselves. What I would suggest is that a child does not need to be in the spotlight constantly to feel good about himself. Even a five-year-old can figure out that everything he does is not extraordinary. He can tell that every painting he does is not a masterpiece. Indiscriminate praise only cheapens achievement. What indiscriminate praise does is reinforce the idea to children that their parents will support them no matter what they do. I think about the 300 teen-agers who trashed a former NFL player’s house. When the player publicized the names and pictures of the teenagers involved, some of the parents threatened to sue him because he would spoil the teens’ chances of getting in to college. Not only had the teens already tweeted pictures of themselves, but it seems to me that the pictures and names are not the issue. It seems to me that children should NOT be taught that they should constantly feel good about themselves. In fact, we all do things about which we should be ashamed. We all do things that are not honorable. What children need to be taught is what to do about that less-than-honorable behavior. Children need to learn how to make amends, to learn to apologize and to consider the consequences of their actions. Parents need to help children to do this by modeling this kind of behavior. The parents of the teens involved in the party could have joined their children in cleaning up the house that they wrecked rather than threatening to sue the homeowner. When I think about the parents who were concerned that the publicity would spoil their children’s chances of getting into college, I think about the students I have at our community college who are parents who are struggling to work, to go to school and to do the best for their children. I see, once again, the huge divisions in social class that exist in our county. I know that some of these children get free or reduced lunch at school. I know that some of these children may wear old clothes to school. These children watch their parents do homework, go school and go to minimum wage jobs so that the children will have a better life. These children may have responsibilities at home like watching younger siblings or folding laundry. These children know that everything they do is not extraordinary, that while their parents love them, they are not the complete center of their parents’ attention. I would like to suggest that the next time someone has the impulse to create a “First day of 3-year-old Kindy” posed photo, that she think instead of doing something to ease the life of a child whose parents are struggling. I would like to suggest that volunteering in a first grade, or starting a program, like some wonderful women in my town have done, that sends food home with children on weekends when they might not have enough to eat sets a better example for our children than taking posed pictures of the first day of preschool or sending them to school with Rolos that look like pencils. Or if a mother must take a picture, how about taking a picture that includes a friend, or even the whole class, demonstrating to her own child that while he is important, the world does not nor should not revolve solely around him. A bold suggestion – this whole topic is still churning around in my head. Today I had one of those morning where we all barely made it out the door alive. The sweet thank you photos I had planned to send out this week seem impossible. But I did manage to apologize to the boys for the rough start to the day and we talked about ways to make tomorrow go better. That might be my best today – and I’m really glad there is no photographic evidence! To me it just seems to be another angle on the belief that children aren’t actually people. For all the times people get loud about not putting significant others on a pedestal because it’s unhealthy and dehumanizing, it’s surprising how little address this gets. jeremiah, I am not sure what you mean here. Children are most certainly people, but too much encouragement and “self-esteem building” is unhealthy. I meant that people who engage in the crafts arms race and ultimate scrapbooking aren’t treating their children like actual people.